BALLSTON SPA, N.Y. and CHICAGO, Dec. 4 /PRNewswire/ -- ReserveAmerica, the United States' leading recreation reservation service, and Equity LifeStyle Properties, Inc. (NYSE: ELS), one of the largest resort owners in America, have launched RVontheGO Club, a loyalty-based membership club serving RV and outdoor recreation enthusiasts. ELS is sponsoring the Club along with ReserveAmerica as an added benefit for resort owners across the country who may be considering other options for loyalty based programs for their specific customers. The new club does not follow the traditional 10% off format, instead offering an original spin on member perks by adding valuable benefits at all participating resorts, along with discounts, privileges and special offers from leading brands. -- Exclusive rates, preferred site selection and priority check-in at participating resorts. -- Advance invitations to events and concerts at participating resorts. -- Discounts on new cottage or home purchases at participating resorts. -- Special deals on select Ticketmaster events throughout the country. -- 30% off and free shipping for the Entertainment book. -- Free photo prints and special offers from Shutterfly. -- Discounts from leading online retailers. -- Included subscription to Prevention Magazine. -- Exclusive rates on property and casualty insurance for your home and RV. "We are excited to launch this new RV club in sponsorship with ELS," said John McDonald, Managing Director, Marketing & Business Development for ReserveAmerica. "As we process over 4 million advance recreation reservations each year, and manage 17 million users to our service, we look forward to offering these customers a new membership to better meet their needs and enhance their overall experience." "We view this Club as a powerful marketing tool that resort owners across the country can use as a vehicle to create brand loyalty, customer retention and new customer acquisitions," said Pat Zamora, Associate Sales & Marketing for Equity LifeStyle Properties. "We look forward to offering this Club to our customers across the country and are excited about the new marketing opportunities the Club presents." 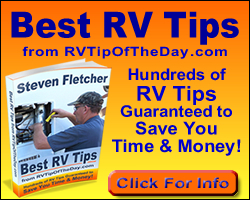 RV and outdoor recreation enthusiasts can visit http://www.RVontheGoClub.com to join now! Resort owners who may be interested in learning more about an affiliation in the Club should contact Pat Zamora at 312-279-1490. ReserveAmerica is North America's leading camping reservation and campground management solutions provider. ReserveAmerica specializes in complete reservations solutions, stand-alone call center/database management tools, online reservations solutions and park software solutions. The Company manages the largest reservable campsite inventory with partnerships throughout North America. ReserveAmerica is an operating business of IAC (Nasdaq: IACI). Equity LifeStyle Properties, Inc. owns or has an interest in 312 quality properties in 29 states and British Columbia consisting of 112,925 sites. The Company is a self-administered, self-managed, real estate investment trust (REIT) with headquarters in Chicago.